Stewart Armstrong Copeland (born July 16, 1952) is an American musician and composer. He was the drummer for the British rock band the Police, has produced film and video game soundtracks and written various pieces of music for ballet, opera and orchestra. According to MusicRadar, Copeland's "distinctive drum sound and uniqueness of style has made him one of the most popular drummers to ever get behind a drumset." He was inducted into the Rock and Roll Hall of Fame as a member of the Police in 2003, the Modern Drummer Hall of Fame in 2005, and the Classic Drummer Hall of Fame in 2013. In 2016, Copeland was ranked 10th on Rolling Stone's "100 Greatest Drummers of All Time". He is also known for composing soundtracks for the Spyro video game series. Stewart Armstrong Copeland was born in Alexandria, Virginia on July 16, 1952, the youngest of four children of Alabama-born CIA officer Miles Copeland Jr. and Scottish archaeologist Lorraine Adie. The family moved to Cairo, Egypt, a few months after his birth, and Copeland spent his formative years in the Middle East. In 1957, his family moved to Beirut, Lebanon, and Copeland attended the American Community School there. He started taking drum lessons at age 12 and was playing drums for school dances within a year. Later he moved to England and attended Millfield from 1967 to 1969. Copeland went to college in California, attending United States International University and University of California, Berkeley. Returning to England, he worked as road manager for the progressive rock band Curved Air's 1974 reunion tour, and then as drummer for the band during 1975 and 1976. In late 1976, Copeland founded the Police with lead singer-bass guitarist Sting and guitarist Henry Padovani (who was soon replaced by Andy Summers), and they became one of the top bands of the 1980s. The Police's early track list was mostly Copeland compositions, including the band's first single "Fall Out" (Illegal Records, 1977) and the B-side "Nothing Achieving". Though Copeland's songwriting contribution was reduced to a couple of songs per album as Sting started writing more material, he continued to co-arrange all the Police's songs with his two bandmates. Amongst Copeland's most notable songs are "On Any Other Day" (where he also sang lead vocals), "Does Everyone Stare" (later to be used as the title of his documentary on the band Everyone Stares: The Police Inside Out), "Contact", "Bombs Away", "Darkness" and "Miss Gradenko". Copeland also co-wrote a number of songs with Sting, including "Peanuts", "Landlord", "It's Alright for You" and "Re-Humanize Yourself". Copeland also recorded under the pseudonym Klark Kent, releasing several UK singles in 1978 with one ("Don't Care") entering the UK Singles Chart that year, along with an eponymous 10-inch album on green vinyl released in 1980. Recorded at Nigel Gray's Surrey Sound Studio, Copeland played all the instruments and sang the lead vocals himself. Kent's "Don't Care", which peaked at #48 UK in August 1978, actually predates the first chart single by the Police by several months ("Can't Stand Losing You", issued in October 1978) as "Don't Care" was released in early June 1978. In 1982 Copeland was involved in the production of a WOMAD benefit album called Music and Rhythm. Copeland's score for Rumble Fish secured him a Golden Globe nomination in 1983. The film, directed and produced by Francis Ford Coppola from the S. E. Hinton novel, also had a song released to radio on A&M Records "Don't Box Me In" (UK Singles Chart n. 91)—a collaboration between Copeland and singer/songwriter Stan Ridgway, leader of the band Wall of Voodoo—that received significant airplay upon release of the film that year. The band attempted a reunion in 1986, but the project fell apart. After the Police disbanded, Copeland established a career composing soundtracks for movies (Airborne, Talk Radio, Wall Street, Riff Raff, Raining Stones, Surviving the Game, See No Evil, Hear No Evil, Highlander II: The Quickening, The Leopard Son, She's Having a Baby, The First Power, Fresh, Taking Care of Business, West Beirut, I am David, Good Burger), television (The Equalizer, Dead Like Me, Star Wars: Droids, the pilot for Babylon 5 (1993), Nickelodeon's The Amanda Show, The Life and Times of Juniper Lee), operas (Holy Blood and Crescent Moon, commissioned by Cleveland Opera) and ballets (Prey' Ballet Oklahoma, Casque of Amontillado, Noah's Ark/Solcheeka, commissioned by the Seattle Symphony Orchestra, King Lear, commissioned by the San Francisco Ballet Company, Emilio). Copeland also occasionally played drums for other artists. Peter Gabriel employed Copeland to perform on his songs "Red Rain" and "Big Time" from his 1986 album So. He has also performed with Mike Rutherford and Tom Waits. That year he also teamed with Adam Ant to record the title track and video for the Anthony Michael Hall movie Out of Bounds. In 1989, Copeland formed Animal Logic with jazz bassist Stanley Clarke and singer-songwriter Deborah Holland. The trio had success with their first album and world tour but the follow-up recording sold poorly, and the band did not continue. In 1993 he composed the music for Channel 4's Horse Opera and director Bob Baldwin. In 1999, he provided the voice of an additional American soldier in the animated musical comedy war film South Park: Bigger, Longer & Uncut (1999). He was commissioned by Insomniac Games in 1998 to make the musical score for the hit PlayStation game Spyro the Dragon. Copeland would play through the levels first to get a feel for each one before composing the soundtrack. He also stayed with the project to create the musical scores for the remaining Insomniac sequels Spyro 2: Ripto's Rage! and Spyro: Year of the Dragon. The franchise shifted over to Universal for the fourth title, Spyro: Enter the Dragonfly, which would be Copeland's last outing with the series. While the soundtracks never saw commercial release, the limited edition of the fourth game came packaged with a bonus CD, containing unused tracks. The soundtracks were very well received, and one track would later appear on the 2007 compilation album The Stewart Copeland Anthology. This period also saw Copeland compose the soundtrack for Alone in the Dark: The New Nightmare, his only video game soundtrack outside of the Spyro franchise to date. In 2000, he combined with Les Claypool of Primus (with whom he produced a track on the Primus album Antipop) and Trey Anastasio of Phish to create the band Oysterhead. That same year, he was approached by director Adam Collis to assemble the score for the film Sunset Strip. In 2002, Copeland was hired by Ray Manzarek and Robby Krieger of the Doors to play with them for a new album and tour, but after an injury sidelined Copeland, the arrangement ended in reciprocal lawsuits. In 2005, Copeland released "Orchestralli", a live recording of chamber ensemble music which he had composed during a short tour of Italy in 2002. Also in 2005, Copeland started Gizmo, a new project with avant-garde guitarist David Fiuczynski, multi-instrumentalist Vittorio Cosma, singer Raiz and bassist Max Gazzè. The band made their U.S debut on September 16, 2006 at the Modern Drummer Drum Festival. In January 2006, Copeland premiered his film about the Police called Everyone Stares: The Police Inside Out at the Sundance Film Festival. In February and March, he appeared as one of the judges on the BBC television show Just the Two of Us (a role he later reprised for a second series in January 2007). At the 2007 Grammy Awards, Copeland, Andy Summers and Sting performed the song "Roxanne" together again as the Police. This marked the band's first public performance since 1986 (they had previously reunited only for an improvised set at Sting's wedding party in 1992 and for their induction into the Rock and Roll Hall of Fame in 2003). One day later, the band announced that in celebration of the Police's 30th anniversary, they would be embarking on what turned out to be a one-off reunion tour on May 28, 2007. 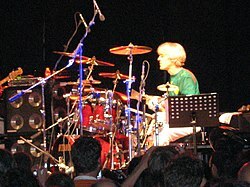 During the tour, Copeland also released his compilation album The Stewart Copeland Anthology, which was composed of his independent work. The group performed 151 dates across five continents, concluding with a final show in August 2008 at Madison Square Garden, New York. In 2008, RIM commissioned Copeland to write a "soundtrack" for the BlackBerry Bold smart phone. He created a highly percussive theme of one minute's length from which he evolved six ringtones and a softer 'alarm tone' that are preloaded on the device. In March 2008, he premiered his orchestral composition "Celeste" at "An Evening with Stewart Copeland", part of the Savannah Music Festival. The performance featured classical violinist Daniel Hope. His appearance at Savannah included a screening of Everyone Stares: The Police Inside Out and a question and answer session. Also in 2008, he was commissioned by the Dallas Symphony Orchestra to create a percussion piece involving primarily Indonesian instruments. "Gamelan D'Drum" was first performed in Dallas on February 5, 2012 and had its European Premiere at the Royal Academy of Music in London in July 2012. On August 21, 2009, at SummerFest 2009, Copeland unveiled the composition "Retail Therapy", which was commissioned by the Music Society. He performed three more original works: "Kaya", "Celeste", and "Gene Pool", the last accompanied by San Diego-based percussion ensemble red fish blue fish. He attended a composer's roundtable and a question and answer discussion in conjunction with the festival. Copeland wrote the score for a theatrical presentation of Ben-Hur, which premiered on September 17, 2009, at the O2 Arena in London. He provided English-language narration of the production, which is performed in Latin and Aramaic. His memoir Strange Things Happen: A Life with The Police, Polo, and Pygmies was released by Harper Collins in September 2009. The book chronicles events in his life from childhood through his work with the Police and to the present. In October 2009, he was a guest on Private Passions, the biographical music discussion program on BBC Radio 3. On May 24, 2011, he started a YouTube channel devoted to his videos and project updates. On this channel, he uploads performances with various musicians, including Primus, Andy Summers, Jeff Lynne, Snoop Dogg, and others in his home studio, which he refers to as the Sacred Grove. On August 24, 2011, he was a featured soloist on the Late Show with David Letterman, as part of their second "Drum Solo Week". On January 10, 2012, he appeared on an episode of the A&E reality series Storage Wars to appraise a drum set for Barry Weiss, buying a Turkish cymbal from the set for $40. In July he reunited with former Animal Logic bandmate Stanley Clarke for a European tour. In May 2013, he and the Long Beach Opera premiered The Tale Tell Heart, an opera based on the short story by Edgar Allen Poe. On November 26, 2013, he appeared in the first episode of The Tim Ferriss Experiment. In 2017, he formed the supergroup Gizmodrome with Adrian Belew, Vittorio Cosma, and Mark King and released an album of the same name. Copeland was romantically involved with Curved Air vocalist Sonja Kristina beginning in 1974, and they were married from 1982 to 1991. Copeland adopted Kristina's son Sven from a prior relationship, and they had two more sons together, Jordan and Scott. In 1981, Copeland fathered a son, Patrick, with Marina Guinness, daughter of Irish author Desmond Guinness. Copeland currently lives in Los Angeles with his second wife, Fiona Dent, with whom he has three daughters (Eve, Grace and Celeste). Copeland's eldest brother Miles Copeland III, founder of I.R.S. Records, was the manager of the Police and has overseen Stewart's interests in other music projects. Stewart's other brother, the late Ian Copeland, was a pioneering booking agent who represented the Police and many others. His father, Miles Copeland, Jr., was a founding member of the Office of Strategic Services (OSS) and the Central Intelligence Agency (CIA), according to his 1989 biography and files released by the CIA in 2008. Despite his occasional references to "Uncle Aaron", Copeland is not related to the composer Aaron Copland. In 2007, the French government appointed Copeland (along with Police bandmates Summers and Sting) a Chevalier of the Ordre des Arts et des Lettres. Copeland's hobbies include rollerskating, cycling along the beach in Santa Monica, California, filmmaking and playing polo. Copeland is also active on his YouTube channel, where he uploads videos of himself and other musicians during jam sessions in his studio, the Sacred Grove. Copeland grew up listening to a combination of Lebanese music, rock and roll, jazz, and reggae, but he selected from these styles what he needed rather than imitating them. In the 1980s, when many musicians were looking for bigger sound from bigger drums, he added Octobans. Invented by Tama in 1978, Octobans consisted of eight six-inch drums in the shape of narrow tubes. He used another innovation, a splash cymbal based on a toy that he owned and that he helped Paiste design. He relied heavily on his 13" hi-hats. Despite being left-handed, Copeland plays the drums right-handed, placing the hi-hats on his left and ride cymbal and floor toms on his right. He uses a wide dynamic range and demonstrates a proficiency of jazz-style articulation in his snare drum playing, interspersing strong back-beats with soft rim comping. During his years with The Police, he became known for engaging only the hi-hat with the bass drum to keep the beat. He is noted for his strong emphasis on the groove as a complement to the song, rather than as its core component. He once drove this point home at a drum clinic: Copeland announced that he would show the audience something "that very few modern drummers can do" and proceeded to play a simple rock beat for two minutes. Nonetheless, his playing often incorporates spectacular fills and subtle inflections which greatly augment the groove. Compared to most of his 1980s contemporaries, his snare sound was bright and cutting. He is also one of the few rock drummers to use traditional grip rather than matched grip. Copeland's equipment includes Tama drums, Paiste cymbals, Remo drum heads, and Vater signature drum sticks. Stewart also uses his own Vater Stewart Copeland Standard Sticks. ^ a b Burke, Chris (17 April 2015). "Classic Albums featuring Stewart Copeland". MusicRadar. Retrieved 8 August 2015. ^ "The arresting case of The Police". BBC News. 30 January 2007. Retrieved 8 August 2015. ^ "Modern Drummer's Readers Poll Archive, 1979–2014". Modern Drummer. Retrieved 8 August 2015. ^ "Stewart Copeland Hall of Fame Induction". Classic Drummer. Retrieved 18 January 2017. ^ "100 Greatest Drummers of All Time". Rolling Stone. 31 March 2016. Retrieved 2 April 2016. ^ Bennett, Tara. "LEGENDARY MUSICIAN STEWART COPELAND REVISITS HIS CLASSIC VIDEO GAME SCORE FOR THE SPYRO REIGNITED TRILOGY". Syfy. Syfy Wire. Retrieved 2 November 2018. ^ "Film: "Everyone Stares: The Police Inside Out"". Washingtonpost.com. 2006-01-26. Retrieved 2015-05-24. Stewart Copeland: I was born in Alexandria (Va., not Egypt). ^ a b Pukas, Anna (27 May 2014). "I wish I'd been nicer to Sting: Stewart Copeland talks about life after The Police". Daily Express. London, UK. Retrieved 13 July 2017. ^ "Don't Stand So Close To Me '86, 12" by The Police - Music and Lyrics". The Police Official Website. Archived from the original on May 24, 2015. Retrieved July 13, 2017. ^ "Stewart Copeland". Stewartcopeland.net. Archived from the original on November 17, 2014. Retrieved January 18, 2015. ^ "Universal Announces Spyro: Enter the Dragonfly". IGN. 19 February 2002. Retrieved 13 July 2017. ^ "Game Music Review: Spyro the Dragon II - Ripto's Rage (PSX Rip)". RPGamers Network. Retrieved 13 July 2017. …this soundtrack is great, highly effective for the game, and an all-around joy to listen to. ^ "Stewart Copeland puts message in a bottle for BlackBerry Bold owners". Apcmag.com. Retrieved October 10, 2011. ^ "Review: Police's Stewart Copeland rocks SummerFest". Sdnn.com. Archived from the original on September 24, 2015. Retrieved October 10, 2011. ^ John Garth (May 12, 2009). "When in London, do as the Romans... Ben-Hur O2 show to be staged in Latin and Aramaic". Dailymail.co.uk. Retrieved October 10, 2011. ^ "Strange Things Happen: A Life with The Police, Polo, and Pygmies". Harper Collins. Retrieved October 5, 2009. ^ "Stewart Copeland Book Signing". Amoeba Music. October 8, 2009. Retrieved October 23, 2009. ^ "BBC Radio 3". Bbc.co.uk. Retrieved October 10, 2011. ^ "Stewart Copeland". YouTube. Retrieved January 18, 2015. ^ Swed, Mark (13 May 2013). "Review: 'Van Gogh' and 'Tell-Tale Heart' have a crazy idea". Los Angeles Times. Retrieved 18 April 2018. ^ "Premiere TV Episode! "The Tim Ferriss Experiment"". Fourhourweek. Retrieved January 18, 2015. ^ Giles, Jeff (15 September 2017). "Adrian Belew and Stewart Copeland Say New Gizmodrome Band Project Was an 'Immediate Lovefest'". Ultimate Classic Rock. Retrieved 12 November 2017. ^ James, Billy (May 2008). "Interview: Sonja Kristina". Get Ready to ROCK!. hotdigitsnewmedia group. ^ a b c d e Copeland, Stewart (2009). Strange Things Happen: A Life with The Police, Polo, and Pygmies. HarperCollins. ^ Pearce, Garth (August 18, 1983). "Shea, yeah, yeah...". The Daily Express. ^ Daly, Susan (July 19, 2008). "Bohemian rhapsody: Marina Guinness and Kila". Irish Independent. ^ Ross, Seamus (March 16, 2008). "Talent on Tap". Sunday Mirror. ^ Copeland, Miles (1989). The game player : the confessions of the CIA's original political operative. London: Aurum Press. ISBN 0948149876. OCLC 21874352. Later, I was one of the 200 employees who were on the original list of career members when the CIA became official in July 1974. ^ Schor, Elana (14 August 2008). "Celebrity spies revealed - new details of Julia Child's pre-chef career released". The Guardian. Retrieved 13 July 2017. [Julia Child's] fellow spies included professional baseball player Moe Berg, US supreme court justice Arthur Goldberg and Miles Copeland, the father of The Police drummer Stewart Copeland. ^ Zimskind, Lyle (May 9, 2013). "Stewart Copeland Opera Opens This Weekend In Long Beach". LAist. Archived from the original on June 22, 2013. Retrieved July 13, 2017. 'Uncle Aaron' Copland, … by the way, is no relation (he spells his name wrong), but I've adopted him. ^ "Cérémonie de remise des insignes de Chevalier dans l'Ordre des Arts et des Lettres à Sting, Stewart Copeland, Andy Summers, du groupe The Police". October 1, 2007. Retrieved May 21, 2013. ^ Prato, Greg (September 8, 2012). "Stewart Copeland Documents All-Star Jams on YouTube". Rolling Stone. Retrieved 13 July 2017. …his main focus nowadays is his own YouTube channel, which features jam sessions between Copeland and some very recognizable names. ^ "Stewart Copeland". YouTube. Retrieved 13 July 2017. Wild Jams at the Sacred Grove: My rock star chums come here to hang and play live music. ^ a b Natelli, John (1 November 2012). "10 Ways To Sound Like Stewart Copeland". DRUM! Magazine. Retrieved 12 November 2017. ^ Wade, Jessie. "STEWART COPELAND RETURNS FOR SPYRO REIGNITED TRILOGY AT COMIC-CON 2018". IGN. ign.com. Retrieved 19 July 2018. "The Bed's Too Big Without You"
"Don't Stand So Close to Me"
"De Do Do Do, De Da Da Da"
"Spirits in the Material World"
"Don't Stand So Close to Me '86"
"De Do Do Do, De Da Da Da '86"
This page was last edited on 16 April 2019, at 21:36 (UTC).